But like I said, we always post these boring looks from business brands. What about the woman who is more daring with her business attire and wants to be remembered as the fashionable one in the office? Glamour, darling, glamour! Well, this roundup is for you. I think these all would look great when worn over a classic black sheath or a chic jumpsuit for work, but for those of you who are into mixing prints and fabrics, go for it! This ruffled lace shrug is only $29.97 and has a fun bedroom vibe to it. Accessorize with vampy red lips and, of course, a sensible padfolio. Only lucky sizes are left, so act fast if you like it. 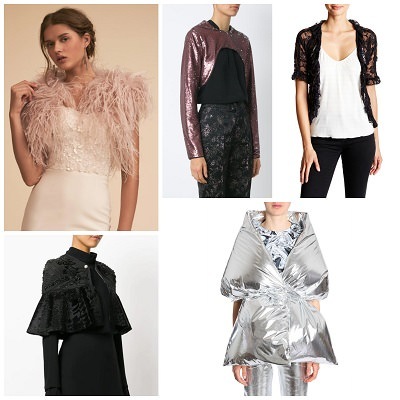 Some people say sequins are not for work, and to those people I say, what next? No lace? No shimmery fabrics? Nothing see-through? Get real, people, and live a little! This shrug kind of stretches my understanding of the definition of a shrug, given that it looks like it’s pull-on but in fact zips up the back, so I’m … shrugging a bit. At the shrug. (See what I did there?) It’s $188 (down from $376) at Farfetch. Some brides-to-be bemoan the fact that you can only wear bridal accessories once or twice — and that may be true for some of those mumsy white lace numbers. 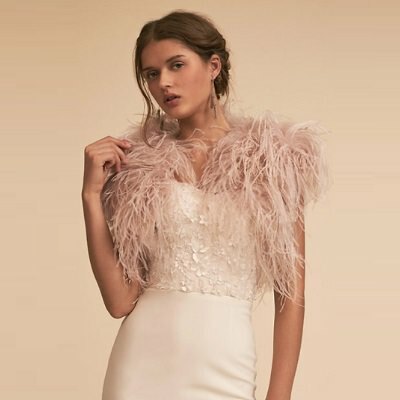 However, I think this feathered shrug from BHLDN crosses the line handily into “desk to dinner” territory — your colleagues will surely think of you as a determined, graceful bird, swooping in to take action. You know, birds are descended from dinosaurs, and dinosaurs were known for being super powerful, so it’s like you’re harnessing dino power. DYNO dino power. The shrug is $300 at BHLDN, available in rose (and ivory, for you traditionalists!) and made from ethically sourced ostrich feathers. Looking for something a bit higher end with even more dino power? Try this feathered bolero. Here I am again, shrugging at a shrug, but only because this one doesn’t seem to have sleeves, so it aligns a bit more with my understanding of “wraps.” No matter! 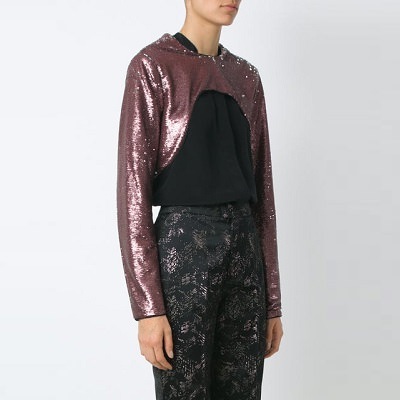 I’m quite sure the designers at MM6 Maison Margiela know what they’re doing in naming it a shrug, so let’s go with it! I like that this one offers you matching pants if you want a full tone-on-tone look, which is obviously very professional and stylish. The “shrug” itself is brilliant — think of how your face will be glowing with all that silver shining up at you! I also like that they added padding, because I mean really, without that it would just look like an emergency blanket, and what’s stylish about that, amirite? This shrug is $405.72 (on sale from $704!) at Italist. I like the Victorian vibes to this cape-like sheath. Chic, and talk about versatile — it will go with all of your black clothes! It’s $1,012 — 20% off, so snap it up. Readers, which is your favorite shrug from today’s roundup? Have you taken any big fashion risks lately? This is excellent. Funnily enough a couple of them are actually kind of cute for very different occasions. 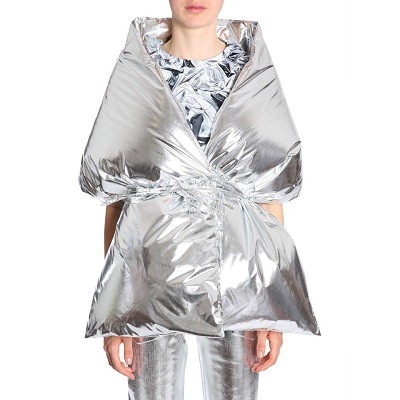 The MM6 Maison Margiela one looks like a sleeping bag. I could take it off at work for a quick nap in my cubicle! Great multi-tasking piece, thanks Kat. +1. Looks super cozy for when the AC is blasting, and my face could use some extra “glow” these days! Killing it, Kat + Kompany. These are hilarious. 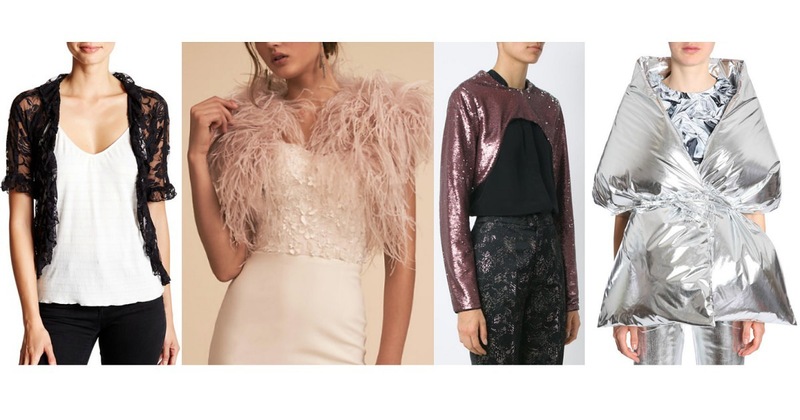 I mean, if there’s a time to wear a pink feathered shrug in your life it’s certainly a wedding. I could see the right bride rocking this! I actually adore that. It would be great for a winter wedding. I had a winter wedding… and I am dying a bit inside, because I had no idea this existed until now. 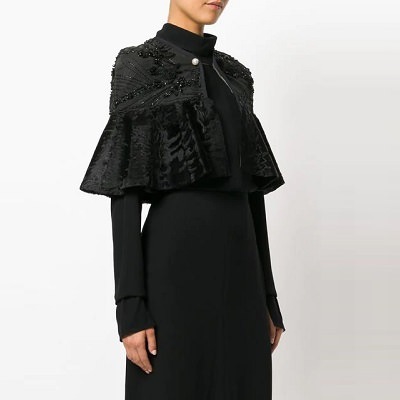 The black, capey shrug would be perfect for Prof. McGonagall’s workplace.